Do you have experience working with Evoke Solutions? Do they deserve to be on the top of the Best Web Design Companies list? What do you think of Evoke Solutions? Leave a comment below. 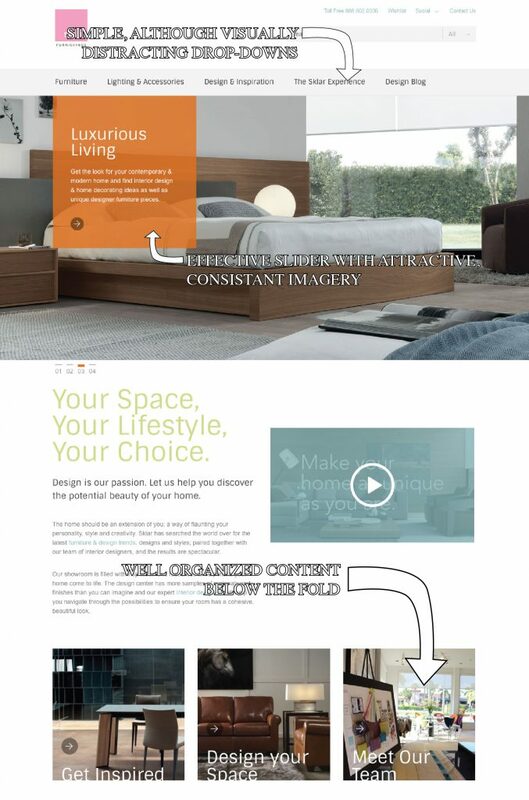 When Sklar Furnishings realized their website needed the modern facelift their products and services deserved, they turned to Evoke Solutions to overhaul their 10 year old site to bring it firmly into the modern era of web design. For the most part, they’ve succeeded in providing Sklar with a clean, minimalist interface that effectively mirrors the image and personality of the company. If there’s anything to complain about, it’s a missing layer or two of polish that could have taken the redesign to the next level. The front page features an elegant images slider introducing the user to who Sklar is and the different services they offer. It’s a nice greeting in both composition and content, paving the way for the remaining information below the fold. The top menu is attractive and simple, although the dropdown menus end up covering much of the real estate on the screen, blocking content that would have been better left unobstructed. It’s a minor gripe, but one that fatigues the user the longer they are engaged with the site. The rest of the site comes together nicely with links to products pages, design inspiration, and their running design blog – all of which entertain the user with unique and creative visual flair. For example, custom icons for product types inver their color scheme when you mouse over them. It’s a subtle effect, but one that works well to set this site apart from so many others like it. Evoke Solutions have done well to assert their creativity where they can without distracting from the overall experience. The responsive optimization work Evoke Solutions put into the mobile side of things is impressive. Tested on an iPhone 6, the site is snappy, clean, and in many ways hides the few blemishes that show up on the web side of things. I found browsing through their product and service pages quite enjoyable from an aesthetic and UI/UX perspective. While these scores aren’t the worst we’ve seen, they are certainly on the bad side of average. We didn’t experience any weighty load times in our time browsing through the site, but the numbers would suggest otherwise. The website is very image-heavy, so someone with a poor Internet connection could have a bit of a wait on their hands. We love this redesign. Evoke Solutions clearly have some experienced design talent working for them and it shows in every corner of the website. Even despite the average speed scores, this site revamp scores high marks for design consistency and creativity, clear organization in user interface, and a knack for adding unique elements and functions that take it to the next level.